I don’t believe I can even begin to count the number of times in my life when I felt like I didn’t belong, like I was out of place. Growing up I was a goofy kid, in many ways I’m still a goofy kid, but back then I was definitely a goofy kid. It’s a terrible feeling but a feeling that is all too human. One of the worst aspects of this feeling was the dread that someone else would also notice, that someone else might point out that I didn’t belong. If I were to pick one such episode from my life, it would be high school lunch. I was right where I belonged, according to my schedule that is, but there was frequently a large amount of anxiety over who I might sit with this time? How might I fit in today? I am all but certain that I wasn’t the only one to feel this way, but it felt like it. Our Gospel today is full of examples of this tension between belonging and not belonging; of being exactly where one is supposed to be but not fitting into one’s surroundings. The first of these examples is Mary and Joseph. 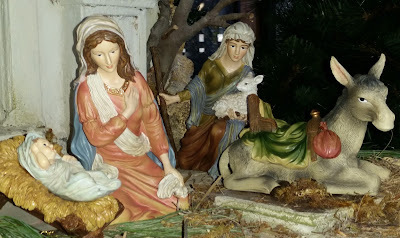 We hear about how in those days the great Emperor Caesar Augustus ordered that the entire Roman world be numbered, and so Joseph left his home in Nazareth and traveled to his ancestral homeland of Bethlehem. He arrived exactly where tradition told him he was supposed to be, but there was no room, no place for them to stay. They belonged there, but they were still out of place. A second example is the shepherds, the first people, the only ones to whom the angels went to announce the birth of the Christ. Now I believe we often have an overly romantic vision regarding the shepherds of the ancient world. You can see evidence of this way of viewing the shepherds in our nativity scene. 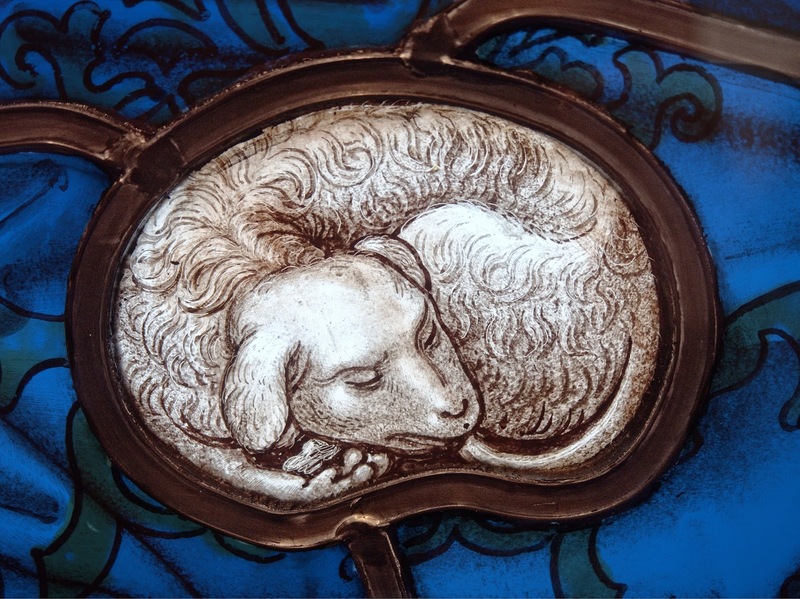 They just look so… nice, but believe me shepherds of that period were not nice. They were anything but nice. These were hard men who lived their lives out in nature. When people worried about night-time traveling they weren’t just concerned about robbers and killers, they were on the lookout for the shepherds as well. These men were often criminals, and they were often feared. All the parents out there, I want you to think back to the birth of your first child. I want you to imagine a big guy coming to the door; perhaps he has tattoos on his face and even a large knife on his belt, and this intimidating stranger says that he wants to see your baby and that a bunch of angels has sent him no less! Just imagine! 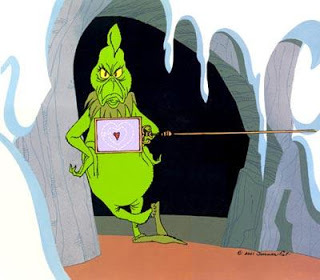 He doesn’t belong, and yet he does belong because the angels went to them and invited them, some of the lowliest and most feared people of that time. Saturday Night Live has often done a great job with their Christmas sketches and this year that had one of Mary and Joseph right after the birth of Jesus. 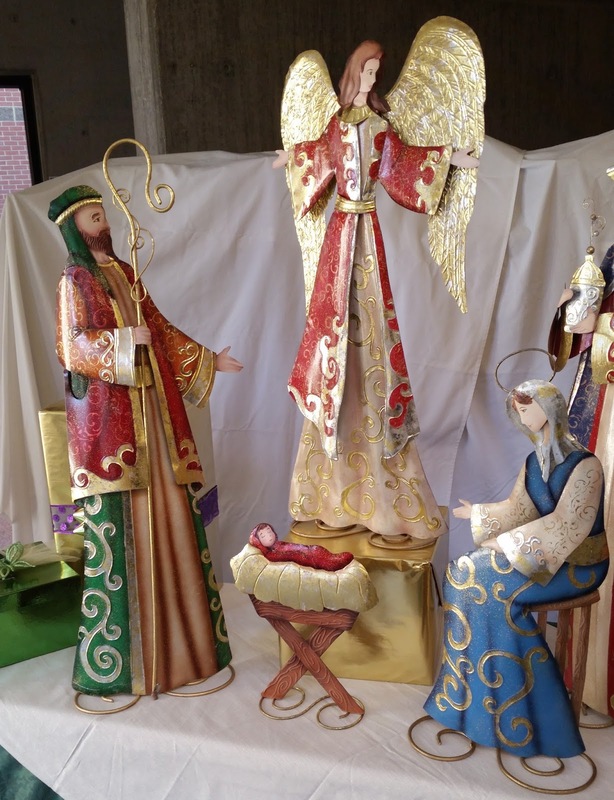 Mary is, of course, exhausted after giving birth, but Joseph is more than happy to let anyone, and everyone, who comes to the door in to see the child while the whole scene dramatically embarrasses Mary. I believe this sketch helps to point out the tension between those who don’t belong and yet do belong. The greatest example of this tension between belonging and not belonging is Jesus Christ himself. Amid all the tension surrounding his birth, God-made-man leaves the safety of the womb and enters the world. If anyone doesn’t belong in this scene, it would be him. There are of course aspects of a child being born in a stable which do not fit but much deeper than that the almighty God has decided to send his word to take on human flesh – the infinite and the finite have mixed. After 2,000 plus years of Christian worship, I think we miss the total audacity which is the Incarnation: God becoming man, perfectly God and yet also perfectly human. He doesn’t belong here, and yet he does all because he decided to, only God can make the impossible possible. I believe this tension between not belonging and yet somehow belonging is near universal to the human experience. Just like in my example many of us wouldn’t have to think outside our experience of high school, either current or years ago, to recall that feels, that terrible feeling of not belonging even though you are right where you’re supposed to be. I have a term for this tension between belonging and yet not belonging and I want to take a second to see if you guess what I’m thinking of… my term for this tension is church, yes, church. None of us belong here; if we take an honest look at ourselves, we’ll see that we are all hypocrites and sinners. I know I am. There are also those ‘out there’ the ones out in the world who might look in and say ‘who do they think are? They’re just a bunch of sinners like the rest of us!’ I says that’s the point, that’s why we’re here, because we’re not perfect and just like the baby Jesus didn’t belong in that manger, and he certainly doesn’t belong among as flesh and blood; that same God-made-man who decided to belong where he didn’t belong makes the same decision to dwell in our hearts. God goes out of his way defying preconceived notions about where and with whom he belongs or doesn’t belong. My brothers and sisters, we belong exactly where we are, amongst other sinners and hypocrites just like us, and our God meets us right where we are. “Way back” at the end of November I ordered a computer, and I’ve been waiting for it to be shipped ever since. At first, they said it would be here by the 9th, then they updated it and said it would be here by the 14th, but I was skeptical that they would hold to that date. It turns out I was right to doubt them – I checked this morning (yes I’m that interested that I checked this morning) and now they are saying it will be here by the 25th. Not only that but the Federal Trade Commission stepped in and required me to accept this change or decline the order – I’m guessing it has something to do with receiving Christmas presents in time for Christmas. Either way, I am beginning to doubt that I’ll ever get the computer. 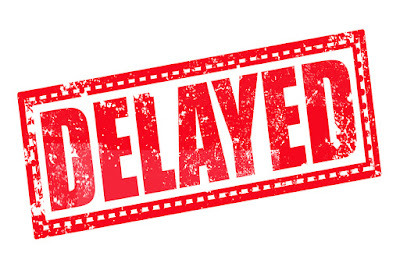 Will it now come when they say it will, or will it be delayed again? My interest in this computer isn’t purely selfish, by the way, I am planning to give my old computer to my sister, so this is sort of for her… sort of. 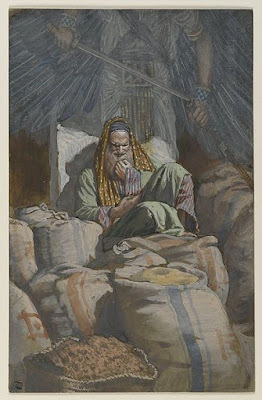 We are in the season of waiting, namely waiting for the coming of the Lord at Christmas time, but I cannot help but see within my situation one of the dangers of waiting. That danger is the connection between waiting and becoming impatient, which can easily lead to doubt. Waiting, it seems, can feel like an eternity and it is not difficult to imagine giving up altogether. The virtue that is the opposite of impatience is obviously patience and the virtue that counteracts doubt is of course faith. In this season of waiting are we in danger of losing our patience, or our faith? Our Advent wreath can be a symbol of waiting. From the time we are old enough to count, I am willing to bet each and every one of us has seen the pink candle burning and thought ‘halfway to Christmas!’ Some may also become impatient with the waiting; I know as a child I did; I would think about how soon it would be until the fourth candle was light and then Christmas would be right around the corner, oh but all the while it seemed so far away! Waiting can lead to impatience which can lead to doubt. No one, it seems, is safe from the possibility of becoming impatient and losing faith. Just look at the example of John the Baptist in today’s Gospel. This is John the Baptist we are talking about, the man whose entire life pointed to Jesus as the Messiah. We now find him sitting in prison, and in prison he has time to think and doubt. While he is imprisoned, he seems to be growing impatient, or even losing faith that Jesus is the Christ. 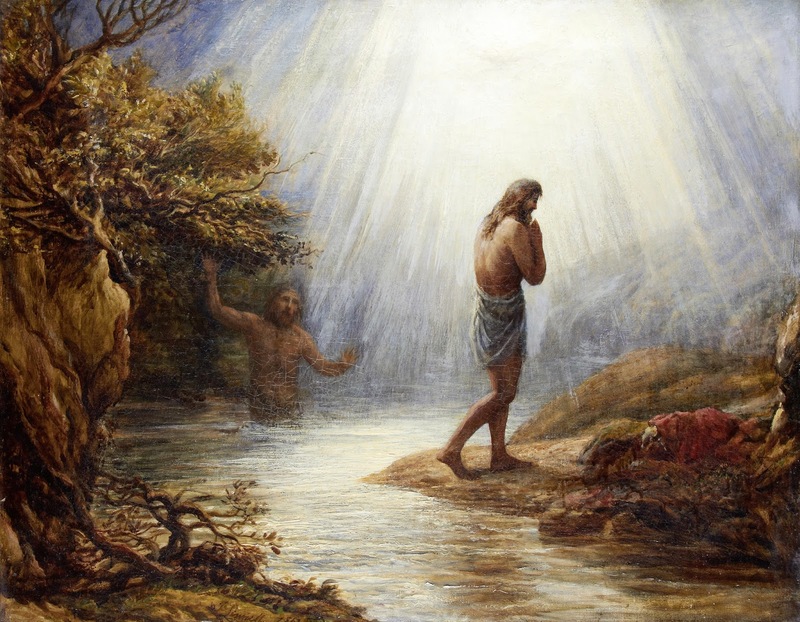 Earlier in Matthew’s Gospel John the Baptist tells Jesus that he should not be baptizing him; instead, Jesus should be the one doing the baptizing. John is convinced, however, and soon after hears the voice of God coming down from the heavens “this is my son in whom I am well pleased.” This is the same John the Baptist who, in the Gospel of Luke, leaped in the womb of his mother, Elizabeth at the very presence of the unborn Jesus. 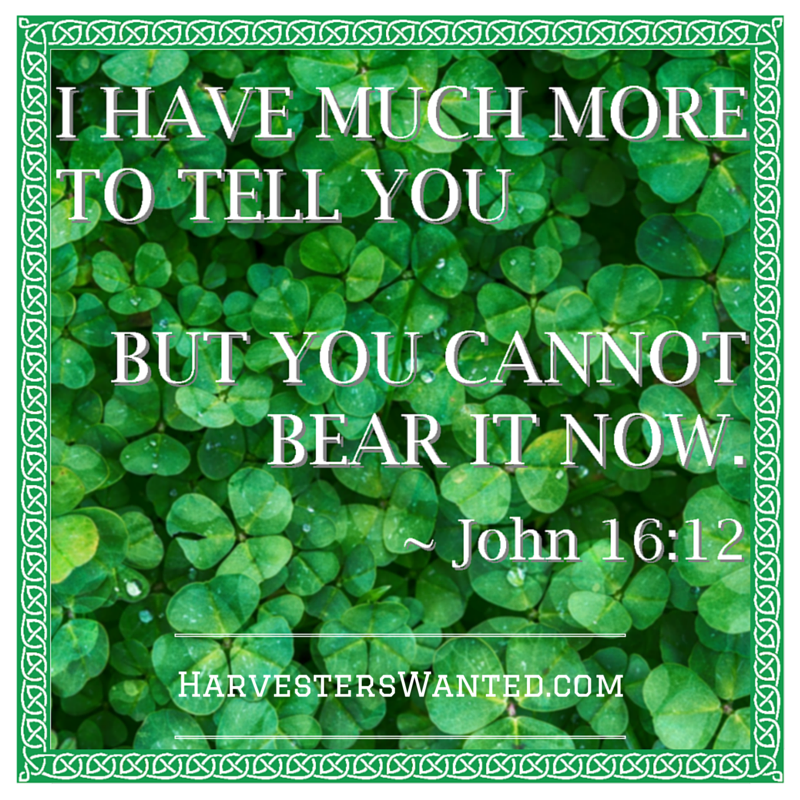 John the Baptist has encountered Jesus and revealed his faith in him and yet here he is sitting in prison seemingly growing impatient and perhaps even losing faith in Jesus. If John the Baptist can have a moment of weakness how safe are we? How quickly we can become impatient with our God, who leaves us waiting for him! The answer to this difficulty, I believe, lies in today’s celebration of Gaudete Sunday. Gaudete is Latin for rejoice, and so I say we are called to rejoice while we wait. Our God who is all loving would not leave us waiting unless there is some good to be found in waiting. In what are we to rejoice? I say rejoice in the fact that God is not done with you yet. No matter how old or how young you are God is not finished with you yet – there is still more yet to be revealed. We must accept the patience and faith that God provides to sit in the tension of waiting, the tension of soon but not yet, the tension that calls us to something greater than ourselves. We might at times grow impatient, or even begin to lose faith, but we can rejoice in the fact that Jesus never loses his patience with us, he simply calls us time and again to come closer to him. In an even greater way, God cannot lose faith in us, for God is faith itself, and God cannot betray what he is. God remains constant and we for our part can ever more prepare our hearts to receive him. The King Speaks to Me? Have you ever felt like God is so distant that you can never hear him? Do you long to hear the voice of God but can’t seem to find it? Our celebration today of Christ the King of the Universe may heighten those feeling. How, or why, would Jesus Christ, King of the Universe speak to me? I know I have been there, especially when times become difficult. I believe that our Gospel for today presents us with a way of expressing this difficulty. Tradition has it that Christ was crucified in-between the two criminals that we hear about in the Gospel. 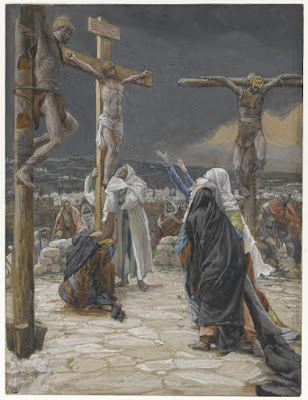 One criminal sees clearly that something special is there and he knows that he can communicate with that presence; the other criminal, and indeed much of the crowd, mock Jesus, deny him, and ignore that presence that is in their midst – they just cannot grasp, for one reason or another, who it is there hanging on the cross. In this way, I believe that our Gospel presents us with a continuum on which we can find ourselves somewhere between recognizing Jesus in our midst and denying that presence. I believe that all of us can find ourselves in-between these two polls and in fact, that is where Jesus is, right there in the middle. Jesus between the two criminals. It is not unusual to struggle to hear the voice and feeling the presence, of God in our lives. How then can we prepare ourselves to encounter that Divine presence in our lives? There are three main ways that our God communicates with us through the Church and that voice then informs our personal prayer and our relationship with the Divine. 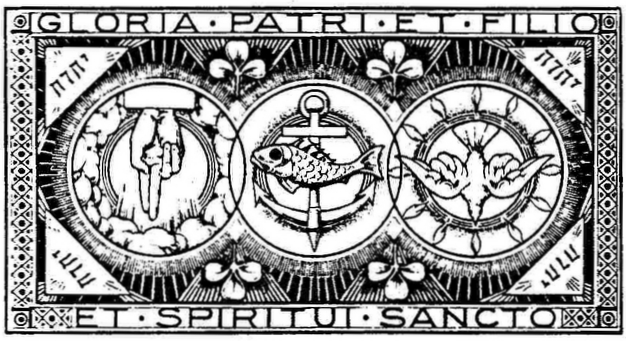 These three ways are: the Traditions of the Church, namely the Sacraments; the teachings of the Church known as the Magisterium; and through Sacred Scripture – the Word of God. It is this final way, through Sacred Scripture, which I want to focus on today. I could just tell you to go home and read your Bible more, and don’t get me wrong it is never a bad idea to open that Sacred book and start reading but there is a lot written there, and sometimes it can be difficult to understand what you are reading – and thus difficult to discern the voice of God, if we don’t have help walking us through it. 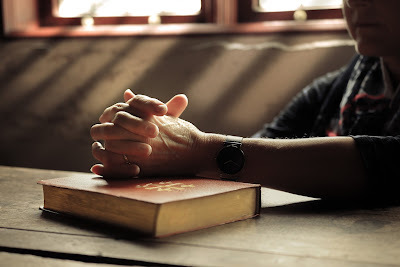 The psalms have been excluded from these statistics because it is difficult to say just how much of that book of the Bible we hear at Mass because they are not only used for the Responsorial Psalm, but also in many of the hymns that we sing. The Book of Psalms is not only difficult to gauge, it is also the largest book of the Bible, so if we presume that we encounter much of the Book of Psalms in the span of three years that increases the percentages for the Old Testament. 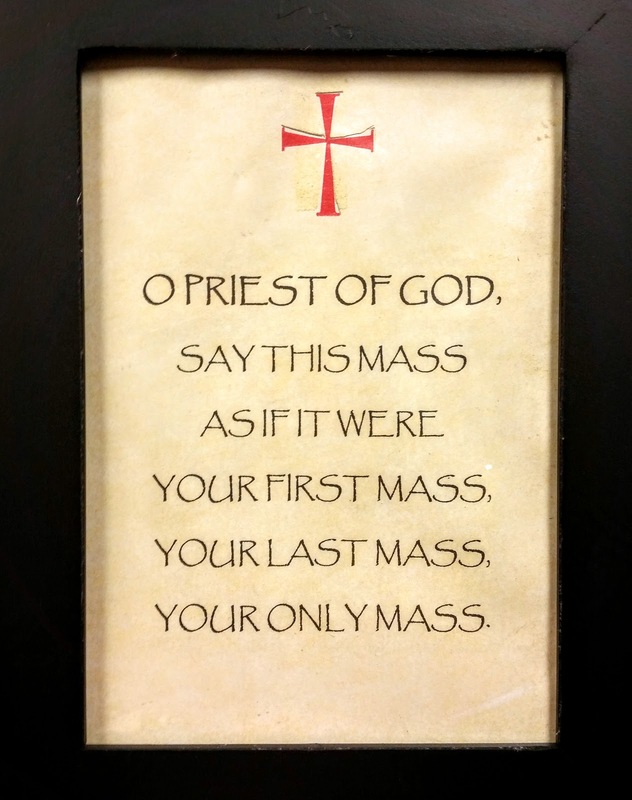 My suggestion for those that don’t necessarily attend Mass every Sunday is first and foremost to do so: we miss you when you are not here, and you miss out on encountering our Lord in the Eucharist and in the readings for the day. But if you are unable to come to Mass every Sunday you might consider listening to the readings online – more of that in a moment. 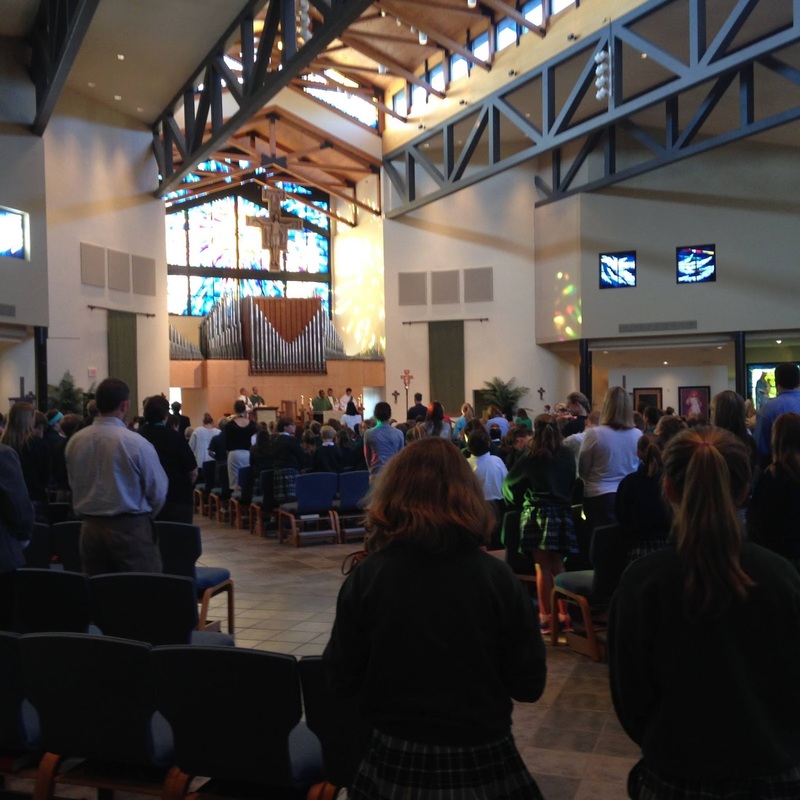 If you do come to Mass every Sunday, perhaps you’ll consider coming to Mass during the week? Even if you can’t attend Mass every day of the week, you might take a few minutes every day to listen to the readings. Now, if you attend Mass every day here at Saint Patrick’s you’re not completely off the hook, we don’t have Saturday morning Mass and so that is one set of readings that you’ll need to find somewhere else. I believe that the Word of God is meant to be heard and so for the days that you are unable to get to Mass I encourage you to take a few minutes and listen to the audio that the United States Catholic Bishops make easily assessable. Look on their website, they have the daily readings written out, they have audio of the readings, and they even have daily reflection videos about the readings. What they have provided is a wonderful resource and if you commit to encountering the Word of God on a daily they have made it as easy as possible. 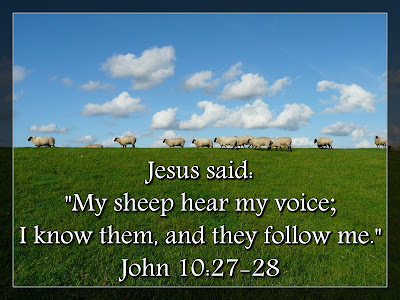 I believe that many of us are desperate to hear the voice of our Lord Jesus Christ, King of the Universe, speak to us and make known his desire for our lives. He wants to speak with you; he is a God that goes out of his way to make his presence known and we might simply be missing out on the many he is speaking to us. In this coming year, A1 take the opportunity to listen to his word, and I assure you, you will hear God speaking to you. Jesus and the Pharisees: Would Jesus Unfriend His Enemies? Seemingly every time he turned around, there they were, the Pharisees, that Jewish religious/political group that hounded Jesus at every turn. They were relentless, and in the end, they conspired to have Jesus put to death. In the Gospels there are 89 references to the Pharisees (Matthew-31, Mark-12, Luke-27, and John-19) and most of them do not speak to a cozy relationship; there are four references to the Pharisees as a “brood of vipers” which helps to define the kind of relationship they had. All the same, there are three references, all found in the Gospel of Luke, to Jesus having dinner with a Pharisee. 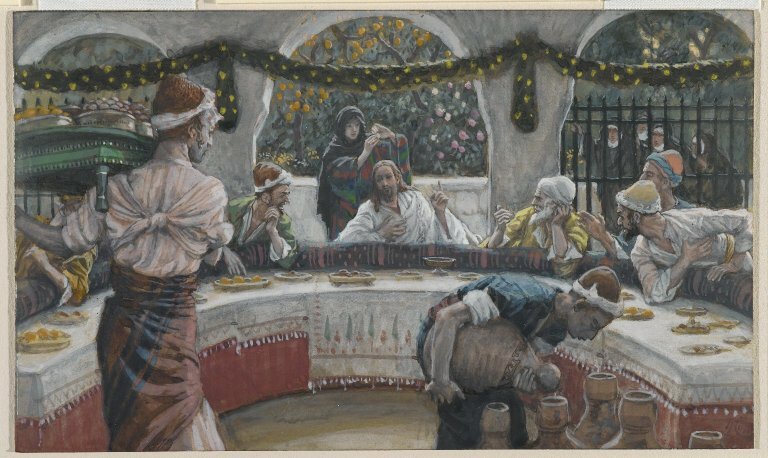 This willingness to have a meal with his enemies is indicative of Jesus’ willingness to love his enemies (Matthew 5:43-48). Humanly speaking we do not often break bread with those we hate or mistrust - to share a meal is intimate, something reserved for our friends and trusted companions. Nevertheless, there we have it, Jesus going out of his way to dine with his enemies. This call to encounter our enemies is not limited to Christ’s example of eating with the Pharisees; it extends to what Christ decided not to do. With infinitely less effort than it takes me to snap my fingers Jesus Christ, God-made-man, could have wiped the Pharisees from the face of the earth, and not only that, he could have removed all memory of them whatsoever. It is so easy to feel justified in our hatred of ‘our enemies’ but the only one who is truly justified instead gave us a living example of mercy. Instead of obliterating the Pharisees, Christ shared a meal with them, and ultimately died for them. When we decide that a person’s views are not worth listening to we are only a hop, skip, and not even really a jump away from deciding that they no longer have the right to live. A bit extreme? I know, but can we honestly say it isn’t true? Can we honestly say that we are immune to the temptation of putting ‘our enemies’ to death? To take this a step further, can we be assured that those with whom we disagree would never consider our demise? I’m afraid, in this climate of political vitriol and polarization, we are far from such assurances. Likewise, it is not surprising that similar ideological disputes have infected dialogue between Christians and in the Church. We hear in Sacred Scripture that “if we live, we live to the Lord, and if we die, we die to the Lord.” (Romans 14:8) Jesus shows us that sharing a meal with ‘our enemies’ is not the limit of how far we may be asked to go - dying for ‘our enemies’ is not outside the realm of possibility. when I became an adult, I put an end to childish ways. I want nothing more than to publicly swear that I have never spoken in a way that is demeaning, or insulting, towards women, but I cannot, and I admit that; I have spoken in ways that I am ashamed of... and I’m sorry. I am sorry for all the times I have told a crude joke or said something negative about a woman based on her looks or being a woman; I am sorry for all the times that I have used ‘locker-room talk.’ What I can do is assure everyone who cares to hear it that I now do my utmost to avoid such talk. I believe that to talk in such a way is childish, and not the way that a true man speaks. Just as Saint Paul tells us, he put an end to childish ways, and speaking down to women - joking about sexually assaulting women - is not only childish, it is dangerous, because it perpetuates a culture that uses, and abuses, women and then trivializes such behavior as ‘boys being boys.’ It is not just boys being boys; it is an aspect of the culture of death that degrades people and makes use of others for one’s twisted pleasure. * It saddens me to see men, and women, defend such talk as anything but an insult to every human person on this earth. When I hear women talk about the vile things they hear from complete strangers as they walk down the street I’m appalled that any man could speak in such a way and not instantly be overcome with their mother’s disapproving voice ringing in their ears! Perhaps that is part of the problem - perhaps the disapproval of our mothers is no longer enough, perhaps the disapproval of our fathers is needed? 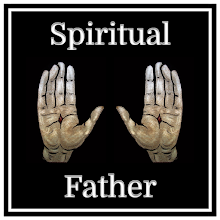 Thus my intention in writing this reflection, to publicly declare my disapproval, as a spiritual father, for any such language or verbal abuse. We must recognize this behavior for what it is - an assault on the dignity of every human person! My dear sisters in Christ, this does not discount your role in upholding the dignity of your fellow women. It is my understanding that you can often be judgmental and insulting towards one another, sometimes based on the same trivial and superficial characteristics that men use to demean women. We must all put aside childish ways and together work diligently to build up the Body of Christ, otherwise we all suffer the same indignity. There are some striking differences in the way that the world views work and the way that God, and the Church, view work. To highlight these differences do any of these sound familiar? "I can't wait till the weekend when I get to be myself." "Even though it's Wednesday... today is my Friday." "Just waiting on the weekend when I can do some real drinking." If you have heard or said, these or similar phrases you have encountered the world's way of thinking about work. 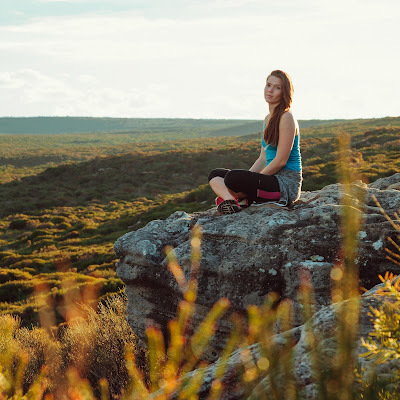 This way of thinking holds that work takes us away from who we truly are and in response we must suffer through work in anticipation for a time when we can 'be ourselves' namely the weekend. This is not the way that the Church views work. The Church holds that to work is part of what it means to be human and that our work should uphold, and stem from, our human dignity and not an activity that somehow keeps us from being who we truly are. In this way we are who we are just as much as when we are at work as when we are at rest - we are not divided, we are a single human person who enjoys the same dignity throughout the week. This fixation on the weekend goes deeper than a mere anticipation for time to relax. To declare another day of the week 'your Friday' or 'your Saturday' is to insist that the ordering of the days and weeks must realign so as to fit your schedule. If you work on the weekends you deserve time off work, you deserve the opportunity to relax and recoup, but this doesn't have to take the form of some calendar struggle to declare when your 'weekend is.' You are who you are whether or not you have your rest day on a Saturday or a Thursday - there is nothing magical about the weekend. This fixation on the weekend and on 'having time to be yourself' in spite of work takes a dangerous turn with the introduction of alcohol. This line of thinking concludes that one cannot drink as much as they would like when they have to get up for work in the morning, and for some drinking gets associated with having fun, relaxing, and 'being who you truly are.' Therefore, people wait on the weekend so that they can drink and be themselves. I have personally experienced this way of thinking, and it is dangerous because it holds that not only are we, not our real selves while at work, but we're also not our real selves when we are sober. The Church again offers us the reality that we are always called to be who we truly are without the need to wait for time off or the weekend to realize our true selves. One final difference between the way we in the United States often view work and the way that the Church views work is seen in the holiday of Labor Day itself. Much of the world, as can be seen in the blue shaded portion of the map, celebrates May Day instead of Labor Day. 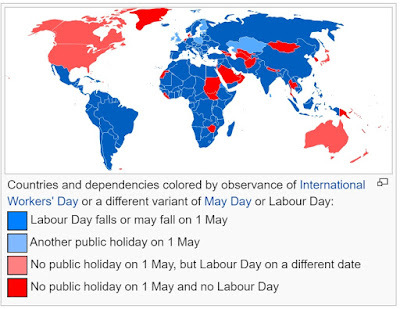 One reason that the United Sates has a different day to celebrate workers is that May Day has Communist origins, but it cannot go without noting that May Day, the first of May, is also the feast day of Saint Joseph the Worker, the patron of all who labor. As Catholics do we imagine that Joseph, the adoptive father of Jesus Christ our Lord and Savior spent his time waiting for the weekend so that he could be himself and drink heavily with Mary? Certainly not! 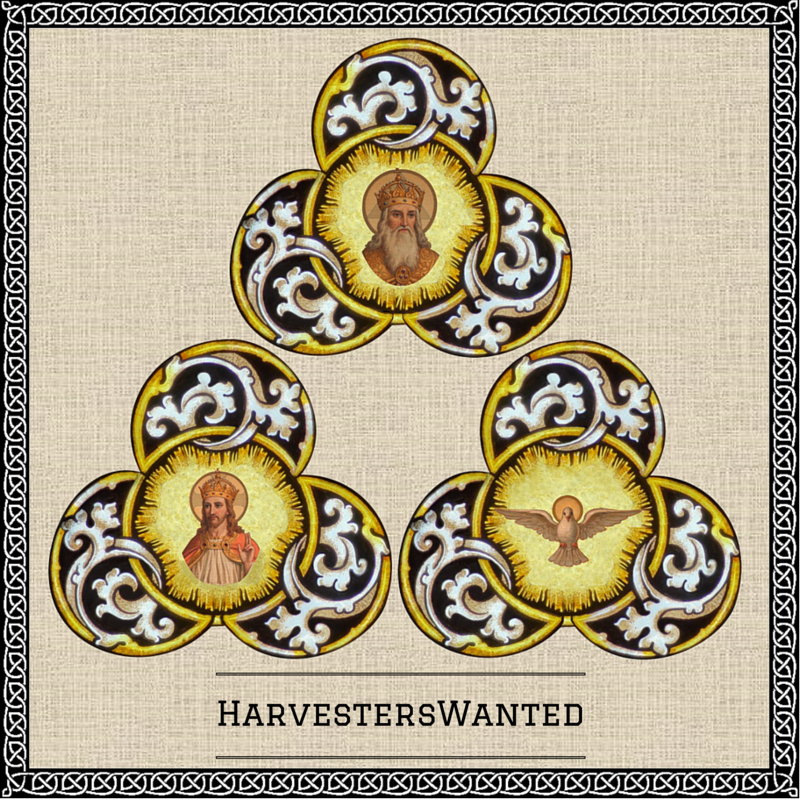 As a Saint Joseph lived his life always striving for oneness with God and assurance that he was called 24/7, 365 days a week to be a disciple of God. That is how the Church views labor - as an integral part of our call to sainthood, not a burden, not a distraction from our true selves, but as part of the road that leads us to God. 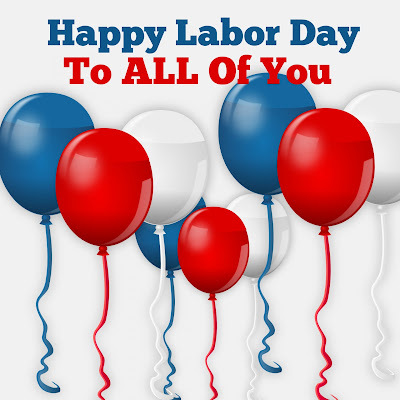 Have a happy Labor Day and use this day to grow closer to the one for whom we all work towards. There has been a lot of bad news lately. Terror attacks, death, uncertainty in the recent day and weeks seems to have multiplied. If you're like me, you try and avoid it a little for fear that it might become too much. It was, however, personally impossible to ignore the recent killing of a priest while he celebrated Mass. The world may seem like it is in chaos, and probably growing worse every day. The longer I have looked at it, prayed about it, and studied it; it seems that the world focuses on two things: fear and emptiness. I encourage you to test this idea, see if you find it true in your lives. The idea is that the world, and the things of the world, leave us afraid, fearful of being hurt, fearful of being taken advantage of, fearful of losing our stuff, our good name, our pride. In this way, the world leaves us afraid of others. This fear of others leaves us empty, always searching to fill this void within us with something, anything. The world leaves us constantly searching for meaning, for love, for comfort from the fear or worse yet it leaves us without hope of that emptiness ever being filled. The world it seems leaves us feeling afraid and empty. In short, the world says to us “build bigger barns” take your stuff, all of that which you try to fill that void within you and keep it safe behind strong walls. Build bigger barns, the world says, isolate yourself behind walls and find a fleeting sense of comfort in material things The rich man in our Gospel built bigger barns, larger structures to keep his stuff his and others out. We know, however, that that man was a fool, as soon as he tore down his perfectly good barns and built bigger ones God tells him that he is going to die. Not only is he going to die but in all likelihood, he is going to die alone. Our Gospel makes it seem that he has no one to share his riches with - he only talks about himself and the question is asked of him “who will enjoy all these good things once you are gone?” How lonely and empty that man must have felt? There all alone, afraid of his mortality and having wasted his remaining energy building barns that hold everything he cannot take with him. 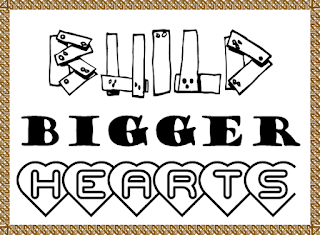 The world says 'build bigger barns', but I say the answer is to build bigger hearts. Build bigger hearts and become more like these children we are about to baptize, live by their innocent witness to the power that Christ can have in our lives if we recognize that we are all like children before our Almighty Father in heaven. Now there is a rather profound theological concept that I’d like to share with you all: it’s the distinction, the difference, between the I and the me. The me is that worldly part of us that is attracted to the fear and the emptiness. The me is always trying to do more for the me, me, me , me - trying to satisfy itself, trying to comfort itself. The I is the part of us that God draws to himself, the part of us that is the child of God. The I may fear, but it never gives into that fear, for the I knows that it can find comfort and satisfaction in God. With God the I is not empty, the I is not a slave to fear. I placed out in the gathering space a picture of a sculpture and below it I have written ‘build bigger hearts.’ Many of you walked right past it, but I encourage you, as you are leaving, to take a good look at that sculpture because I believe it helps to clarify this idea of the I and the me. The main part of the sculpture is two wire figures, sitting back to back, and the viewer gets the sense that these two people are in an argument, but they are fed up with one another. They are back to back but world’s apart. These figures signify the me; this is the part of us that is in constant competition with one another and because of this they remain fearful and empty. 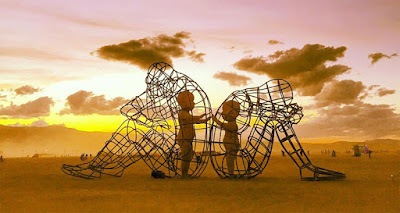 Inside these wire figures, however, are solid figures of children, and these children are trying to reach out to the other, but the wire figures prevent them from reaching one another. These children are the I, the child of God that calls out from each of us to be in communion with one another and with God. The world will tell us that it is foolish to live as a child of God, to live out of the I, but isn’t that just the kind of fear that the world throws at us? I say you are going to be a fool either way, either a fool of the world, the kind of fool that builds bigger barns, or a fool for Christ, the kind of fool that builds bigger hearts. You may be asking: ‘how do I build a bigger heart?’ I cannot answer that because it is not something as simple as giving more money, or volunteering more - a person who builds a bigger heart will want to do that naturally. Instead, I leave it up to you. What does your heart say? 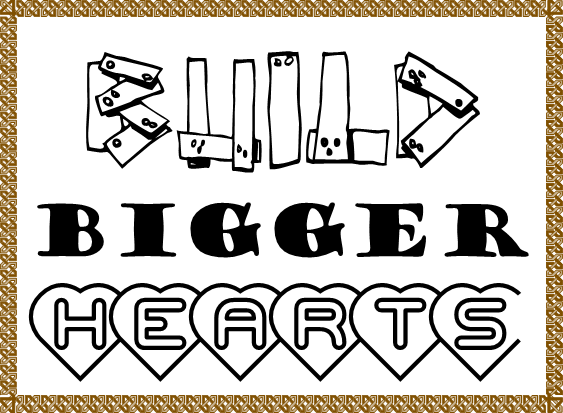 What does the inner child of God say you should do to build a bigger heart? I want you to listen to that voice, listen to what your heart has to tell you and join me in building bigger hearts by being fools for Christ. I feel as if I should apologize; it seems that my face is everywhere. I'm really sorry. 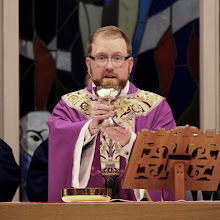 I have seen my face on the website; it's on Facebook, there’s a Fathead - that one took me by surprise, as well as a poster out there in the narthex, the gathering space. On that poster, besides my face, there is my favorite Scripture verse which is: Jesus said to them ‘unbind him and set him free.’ This verse is from the Gospel of John, and it is the scene where Lazarus has been raised from the dead. Even though Christ raised Lazarus from the dead, he was still bound by the bandages, the wrapping that they used to lay him in the tomb. He was alive, but he still needed to find freedom, so Christ ordered those who were around to do just that - to set him free. We as a society are obsessed with freedom. We are in the season of freedom, we have our fortnight for freedom, here in a week we will celebrate our freedom. Our freedom is certainly not far from our minds these days. 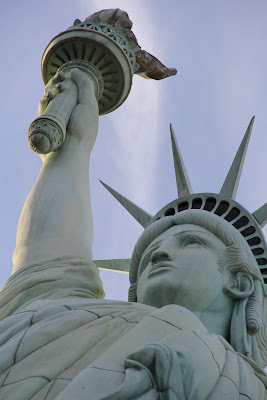 I find that when, as Americans, we think of freedom we think in terms of what we are free from: tyranny, oppression, over taxation, regulation... for the school kids they are currently free from school, during the weekend many of us are free from work - when we are free we don't have to worry about any intrusion that takes away our freedom. When the Church, when Christ, talks about Freedom, however, we hear about freedom regarding what we are free for. 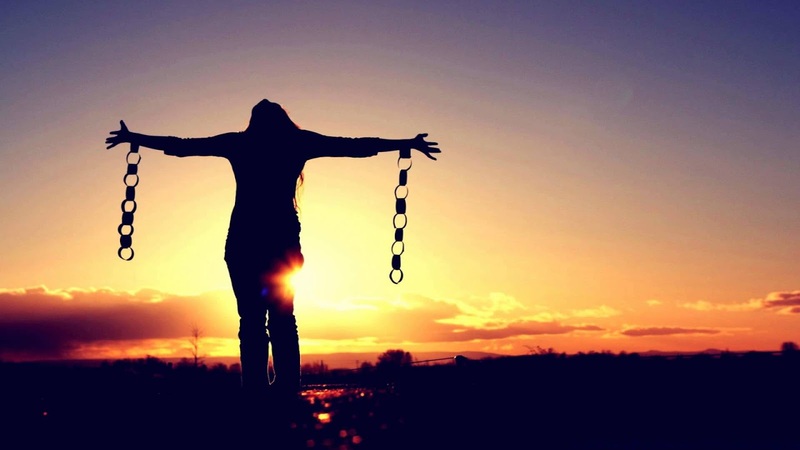 When we are freed from something we are often left there, perhaps wondering what to do with this freedom. But when we are freed for we know for what purpose we are set free. In our second readings today we hear Saint Paul tell the Galatians about freedom. He declares that it is for Freedom that Christ set us free and that we are brothers and sisters called to the freedom of Christ. To be a disciple of Christ is to be free. I try and live a life example as an example of that freedom, an example of what it means to be set free from the things that bind but also an example of what I am free for. It is with this in mind that I'll tell you a bit about myself. First I know that schools are vital to us, you have to go through the list, so I went to Saint Aloysius in Pewee Valley for grade school, I graduated from St. X in ‘01, and I studied history at UofL- this last affiliation will make things interesting at the rectory... we’ll suffer together, or more likely I’ll suffer, and he’ll do his thing... It was after I graduated from college that I really began seriously discerning a vocation to the priesthood. That’s when I first meet Fr. Jeff. In fact, we were sitting in a restaurant about nine years ago now and I kept wondering why he insisted on talking so loud about the priesthood - I was worried people would look at us weird. One milestone lead to another and eventually I began studies at Saint Meinrad Seminary where I graduated last spring. The path to priesthood is rarely an easy or straightforward path and a few difficulties stood in my way. I have shared these struggles elsewhere, and I want to make sure that you hear about these struggles from me. I have, for most of my life, struggled with depression and anxiety. These are maladies that affect many people and often they can go hidden and untreated. My brother too suffered from similar difficulties and three and a half years ago the pressure of those ailments became too much, and he took his life. I had, even before my brother’s suicide, self-medicated with alcohol. That nasty habit only got worse after my brother’s death. It almost cost me my life and possibly the life of a faultless bystander when, after my first wedding as a deacon, I drank too much and drove. I am ashamed that I did this but thank God that I hit a telephone pole and not a person or another vehicle. It was from there that my life could have either gone further from God by giving into self-pity by listening to all those thoughts of ‘why God has this happened to me! ?’ Instead, I chose the freedom that God called me to; freedom to let go of all the things which I held onto and move closer to God - the source of true freedom. Fr. Jeff was one of the first phone calls I made, and I began surrendering a lot of my freedoms with the hope of gaining true freedom. I went away for six months and got some much-needed help; I came back, and even though it was difficult I returned to seminary and was eventually ordained to the priesthood this past December. I was freed for ministry as a priest, I was freed to minister to your spiritual needs, I was freed to be an example for the school kids and a living witness for the girls at Sacred Heart. I was freed to be present to and offer the sacraments for, all those who approach the Church through me. I have been freed for a life of discipleship. I look forward to walking alongside each one of you as we together find the freedom to which Christ calls each of us - the freedom to live in the Kingdom of God. I have two stories that I wish to share with you. Both took place while I was studying to become a priest and both have to do with the Eucharist. The first story is the earlier of the two. I was on the way to a friend’s house, having already picked up another friend. I was thinking I had already done a good deed by driving her and all. I should mention that she is a very devout member of another Christian denomination. As we are driving along, I could tell she wanted to talk about religion, and so I thought "alright, I’m a seminarian now, sure we can talk about our shared faith." So she asks me “you Catholics don’t actually believe that communion is the actual body and blood of Jesus do you?” I replied, “well, yes, it’s kind’a what we do.” And without missing a beat, seemingly without taking a moment to process, she says “no it’s not.” I was, needless to say, taken aback and I began to wonder rather sarcastically ‘well yeah, I guess since you’re so confident, I'll give up everything that I have felt the entirety of my life had directed me towards because I was mistaken.’ That is why we have priests, to call down the Holy Spirit and consecrate the Body and Blood of our Lord Jesus Christ and bring that presence to the people of God. I have since realized that she was simultaneously saying ‘no’ to me, and what I was giving my life to, and ‘no’ to the Eucharist itself. Second story. I was in my CPE summer, which stands for Clinical Pastoral Experience but what it should be called is Trial by Fire. This assignment is one in which seminarians spend their time serving as a chaplain at a hospital along with other members of different denominations, and it is meant to be a mentally, physically, and emotionally challenging experience. One of the reasons is the other chaplains and their ideas of what Catholic do and do not believe. One day one of the chaplains, in reference to the Gospel of the feeding of the five thousand which we just heard, asks “what’s with you Catholics anyway? All those who showed up were fed by Christ, and it’s not like they had to have their Catholic membership card or anything!” What he was getting at was his tradition’s practice of open communion - meaning anyone who attends their services are welcome to partake of communion, and he was proud of this fact. In addition to that pride, this chaplain seemed to get offended when I would talk about the importance of what we Catholics call the Eucharist. He was saying ‘yes,’ or at least thought he was saying ‘yes,’ to the people, by welcoming all to communion, while simultaneously saying ‘no’ to the Eucharist. As he’d tell you, he doesn’t believe what we believe about the Eucharist. 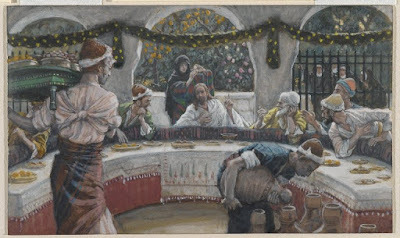 He was also, in the end, advocating the possibility of someone coming in off the street, ‘taking’ Holy Communion, and walking out without opening themselves up to being transformed by the Eucharist AND the Body of Christ present in the assembly. Our Gospel reading shows a group of people that have said ‘yes’ to God, a group that has gone out of their way - into the desert - to follow him, and they did this without receiving the Eucharist! Christ had not died on the cross yet; Christ did not say the words “this is my body” and “this is my blood, the blood of the new covenant.” Christ fed them, which is good, but they gathered together as one before they were made ready to receive the Eucharist. We often forget, in our modern society, how important food is. I could leave this church and within a mile get enough food to eat my fill and then some! Food for the ancient people meant life and to share it showed that you trusted. The people showed their trust in Christ, in God’s ability to care for them, as well as their trust in each other. They also did what the Apostles asked them to do. They didn’t take the food and leave to eat in the safety of those familiar to them; instead, they sat down in grounds of about fifty, and they all ate together. They said ‘yes’ to Christ and ‘yes’ to the people. 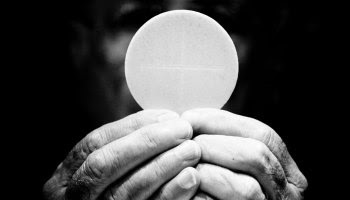 As Catholics, we know that the Eucharist is the Body and Blood of Jesus Christ, as difficult as it is to believe at times we hold to the truth that Christ came as a human being and returns time and again through the Holy Eucharist. We believe that he meant it when he said “this is my body, take it” and that he meant it for all people, throughout all time, but we cannot fully respond without becoming what we eat, becoming Christ for one another, to become Church for the world. We have to be able to go into the desert with Christ, and his followers, sit as we are told - he told them to sit, and they did, and we are called to do the same and receive even more than they received. That ‘yes’ to one another, that is not a simple or half-hearted yes, that is not an immediate yes to “hey give me that” or “just let me do what I want” it is a profound yes to the very core of what it means to be human, and a follower of Christ. This is a ‘yes’ that sees the other through the eyes of the Eucharist, the way in which I see you as I say “the Body of Christ” and you respond Amen - which means yes. 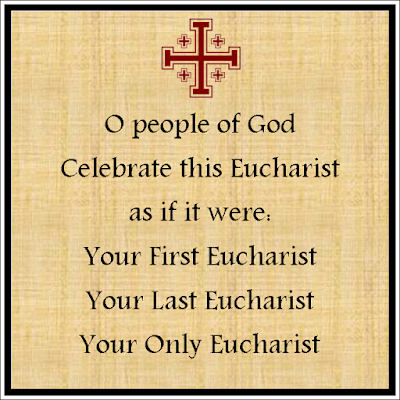 This great yes is the kind of yes you will give to the other Eucharistic ministers as well when they present the Body and Blood of Jesus Christ to you - when you see each other through the Eucharist. When I see you through the Eucharist, I am saying yes to you through the Body of Christ, and I pray you are willing to say yes to me. We do not take the Eucharist, we receive the Eucharist, and we say yes to Christ and yes to one another and then we don’t leave, we stay with one another we remain with one another, and we trust in one another which allows God the chance to work on our hearts. Today, when you receive the Eucharist, say ‘yes’ to Christ and say ‘yes’ to your sisters and your brothers. We are often confronted with mystery; I do think we rather enjoy it, though. The thrill, the suspense, the unknown, the possibilities; all of these frequently captivate our imagination. Whether or not it's the TV shows we watch, the movies that interest us, politics, books, or simply where did that matching sock go to? Mystery surrounds us all the time. Even our music has a bit of mystery, like what does that artist mean when they sing that, or is Taylor Swift singing about this guy or that guy, and will they stay together this time? All of these mysteries have one thing in common, however; that an effort is made to keep the mystery a mystery. Where's Waldo would not be much of a mystery if Waldo jumped out of a page waving his arms! Likewise, a good government conspiracy would not be much of a mystery if they advertised in the local newspaper. A mystery, or at least the people behind the mystery, try to maintain the mystery. The Christian faith has a lot of mysteries, mysteries that confound the modern world and these are a different kind of mystery altogether. We are in the season of mystery, one might say. We just finished up the season of Easter, a season in which we celebrate the mystery of the death and resurrection of Christ. Two weeks ago we had the Feast of the Ascension, Christ rising to heaven. Last week we celebrated Pentecost, the coming of the Holy Spirit, a mystery in and of itself. 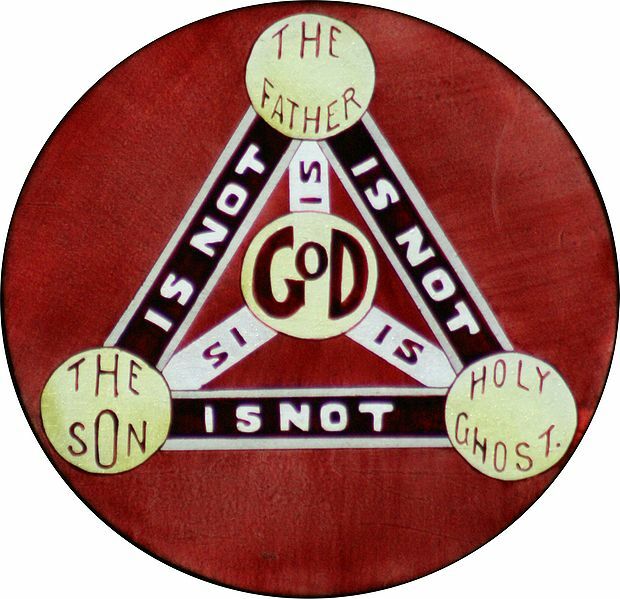 This week we are celebrating the great solemnity of the Most Holy Trinity - three persons one nature - about as deep a mystery as we can go? Finally, next week we celebrate the Solemnity of the Most Holy Body and Blood of Christ, the Eucharist, a mystery to be thankful for! At the beginning of Mass, we often hear the words “brothers and sisters let us called to mind our sins, and so prepare ourselves to celebrate these sacred mysteries.” Christians know that they celebrate some of the, if not the most, mysterious of mysteries. Nevertheless, these are mysteries that reaches out to help us understand what is otherwise mysterious. Let that sink in for a moment, we celebrate a mystery that reaches out, and itself tries to make itself known. What kind of mystery would do this? What kind of mystery attempts to make itself known? The kind of mystery that is based in love, pure, selfless love. 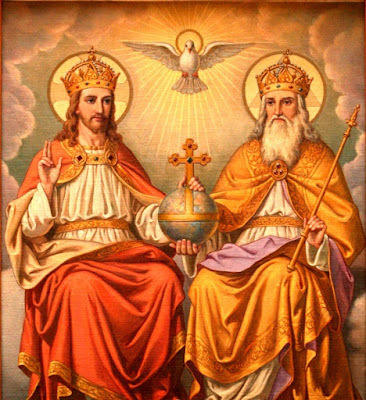 There are two images of the Trinity that I wish to expand upon today. The first is Holy Scripture itself, the word of God, the Bible. Christ said in the Gospel that we heard today that “there is much more to tell us but that we cannot bear it now.” Christ knew that there was much more left to teach, that the mystery had not come to a fulfillment within his life on Earth. It has been said that the Old Testament represents the age of the Father, the age of coming to understand that God has created us, sustains us, and calls us to be his chosen people. The Old Testament, the age of the Father. The Gospels then represent the age of the Son, the life, death, and resurrection of Jesus Christ. His teaching, his preaching, his miracles; his life. The Gospels, the age of the Son. Finally, the rest of the New Testament, up until our current day, represents the age of the Holy Spirit. An age of growing understanding of how the church is to be in the world, an understanding of that which Christ wanted to teach but left for the Holy Spirit to guide us to. The New Testament, the age of the Holy Spirit. Just by looking at the way in which Holy Scripture is gathered we get a sense of the Trinity even though it is not distinctly mentioned in Holy Scripture. The other image of the Trinity that may be helpful is that of an overflowing fountain. The love of the Father, at the top of the fountain overflows, and the Son is called into being; and likewise, the love of the Father and the Son overflows and the Holy Spirit is called into being. 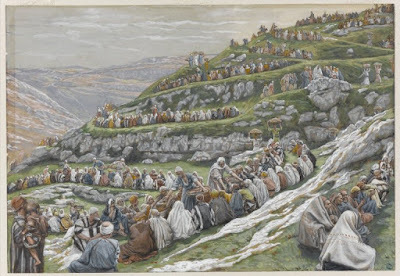 We read in Proverbs, in our first reading, that “the Lord possessed me, the beginning of his ways, the Forerunner of his prodigies of long ago; from of old I was poured forth, at the first, before the Earth.” We can see this image of the outpouring of the Father's love, and then looking at the second reading we see that in Paul's letter to the Romans he says that “the love of God has been poured out into our hearts.” In this way, we see that the love of the Father overflows into the Son, and the love of the Father and the Son overflows into the Holy Spirit, which in turn overflows and fills our hearts. We are, therefore, provided for by the love that overflows from all three, for the love that exists between them sustains us, and calls us back to the source. 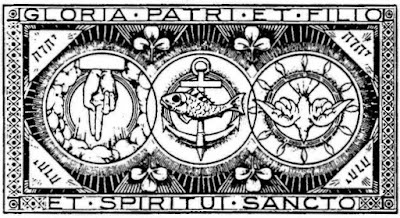 So what then does the knowledge of God as Trinity do for us? A perfectly timed question from one of our first graders right before the 5 p.m. Saturday Mass helps to clarify the significance of this important day. She asked me who created God? And I told her that nothing created God, God always has been, if something had created God, then that thing would be God. It means a lot for our faith that God decided, for no other reason than a desire for relationship, to be more than one, to be Trinity. God would have been perfectly all right being one, but God decided to be Trinity, and then God decided to extend that desire for a relationship with Creation itself. It may come as quite a shock for some, but God has no need for any of us, God would have been perfectly fine without us. In light of God's love, poured out into the Trinity, and overflowing into our hearts, we are called to share that relationship with one another. The very fact that God calls us into his mystery tells us that we are not meant to be a mystery for one another. We are called to be known by God and to reveal ourselves to one another. It is easy for the world to tell us that we are a mystery, that no one else can understand us, can get us, because of our particular circumstances. The world tells us that we are a mystery and will remain a mystery but our God, who is Trinity, tells us that we do not have to be a mystery. 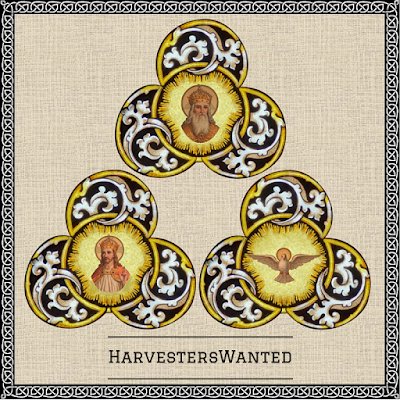 Today we celebrate the mystery of the Trinity, we celebrate by revealing ourselves to one another. It is important that our God is Trinity who we worship here today. 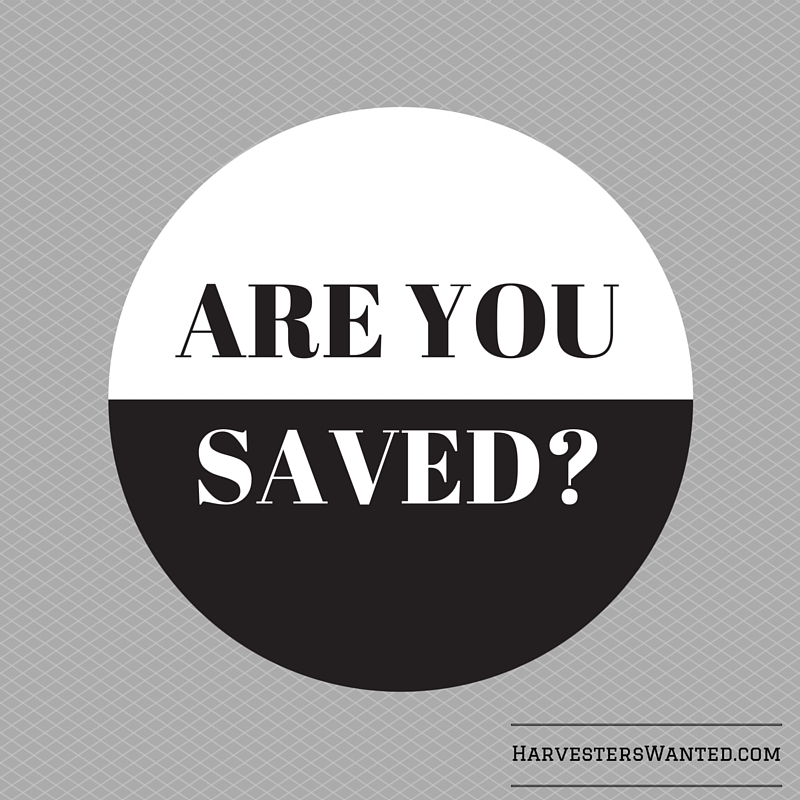 Have you ever been asked the simple question: are you saved? It can be a strange question to hear as a Catholic. If you were anything like me when first asked that question, I was 16 or 17 at the time, you probably felt a bit awkward, and weren’t certain how to respond. The man who asked me this question wasn’t asking, he was more demanding an answer as he cornered me at my first job. I think the first time he asked - he repeatedly asked at that time and in the days to come - my response was ‘what do you mean?’ That interaction has stuck with me for years mainly because of the way that the simplicity of the question didn’t seem to rise to the complexity of the subject matter; plus the man who asked me was known to be consistently defaulting on his child support. How is he, I often wondered, so sure of his salvation while failing to support his children? It wasn’t until years later, when I went to seminary, that my inability to answer this question was laid to rest. In conversation with professors and other students the answer was given: yes, of course, you are saved (but here comes the fuller - more Catholic response) yes I was saved, yes I am saved, and yes I will be saved. I was, I am, I will be saved. At the moment Jesus died on the cross, he died for all sins both past, current, and future and I was saved. When I receive the Eucharist, when I am Baptized, when I am Confirmed, when I am Anointed or receive Reconciliation, when I gather together with the body of Christ and worship our God - I am saved. In the second coming, when Christ returns to make all things new - I will be saved. As Catholics, simple answers rarely do justice to the complexity of the question, and we do not believe that a particular moment in our lives seals the fate of our soul, for either good or ill. The Book of Revelation, which we heard from in our second reading, uses a lot of the same concepts in its account of the coming of the Kingdom of God which already is present and not yet fully present. The imagery speaks to what has happened to the early Christians, everything between then and now, as well as what will happen. It is unwise, and honestly a bit conceited, to think that all that the Book of Revelation contains is meant to show our generation, or perhaps me personally, what will happen in our lifetime. Instead of being only future driven The Book of Revelation incorporates the entire experience of the community – a community that is expected to live and work, rest and grow old- together. The Book of Revelation is telling us that the Kingdom if God is being made real and the Lamb of God declares “Behold, I make all things new.” In this way, salvation is a process, a process of being made new in Christ; both for the individual and the community. 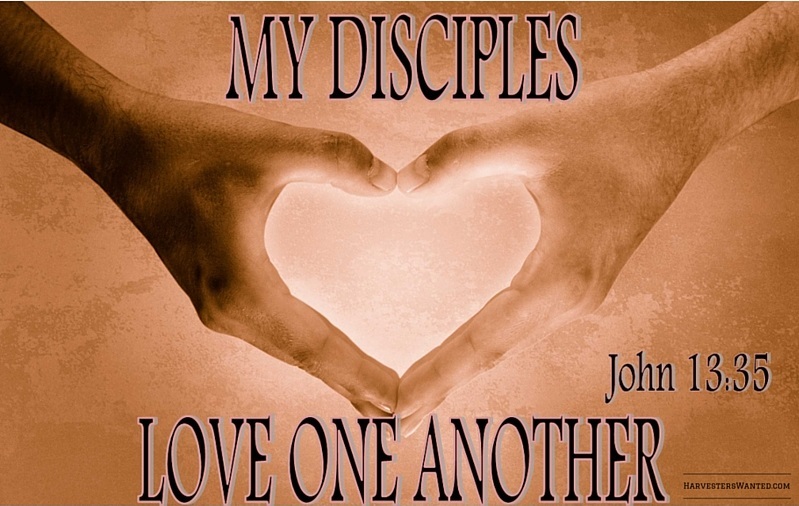 Our Gospel tells us that just as Jesus loves us, so we also should love one another. Judas had just gotten up and walked out before Jesus said this. We are to love those who are like him just as we are to love those who are like us. 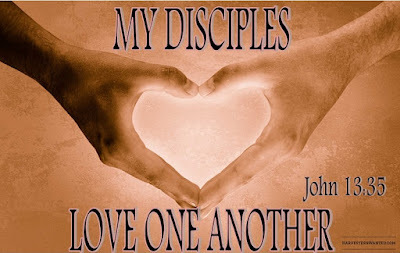 Christ tells us to love one another, just as he loves us – until death, and from that others will know that we are his disciples – and the community will grow and the Kingdom of God will become more visible on Earth. We are told to love one another, not to love only when we are loved, not to love only when the person deserves our love, we are told to love. Perhaps we will lose our lives to love, or hurt by love, but we are told to love all the same. Sometimes love means holding tightly to another, and sometimes love means letting go and respecting one’s self and the other by parting ways. We must not lose sight of Christ’s love for us inorder to try and love another. 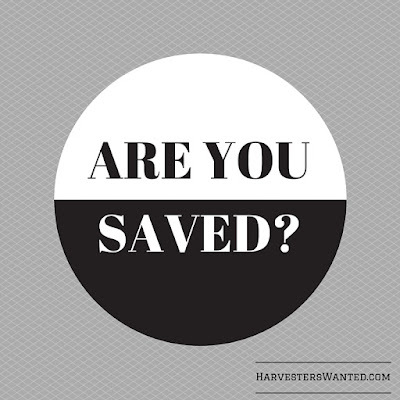 So are you saved? Yes - you were saved, yes - you are being saved, and yes - you will be saved – all because you loved one another. It is easy for anyone to become complacent even when faced time and again with the miracle of the Eucharist. I hope that keeping this in mind might change one’s perspective for many of us. 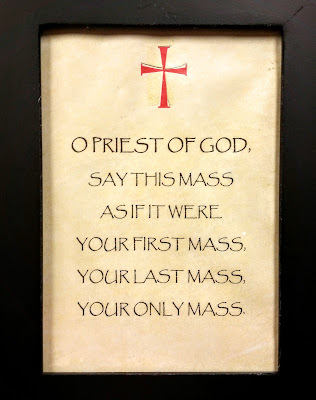 I think it's not just the priests who have to make sure that they do not lose their zeal for the Mass; to not make it just a routine, just a bunch of words to be said. It's important for all of us to remember that we are all essentially like these wonderful children coming before the Lord's Table for the very first time. It is important that we gather together as a community and see these children together, to recognize them for having prepared to receive the Eucharist. 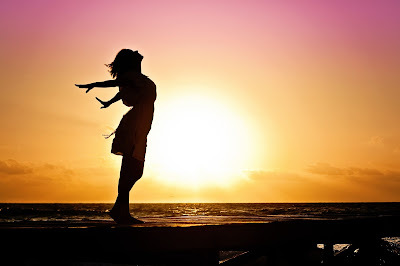 I have often heard it said, and it may be the case with you as well, ‘oh to have the faith of a child, if I could just believe like they did, like they do, if I had that kind of faith life would be so much simpler!’ So I asked you: why not? Why not have faith like a child? 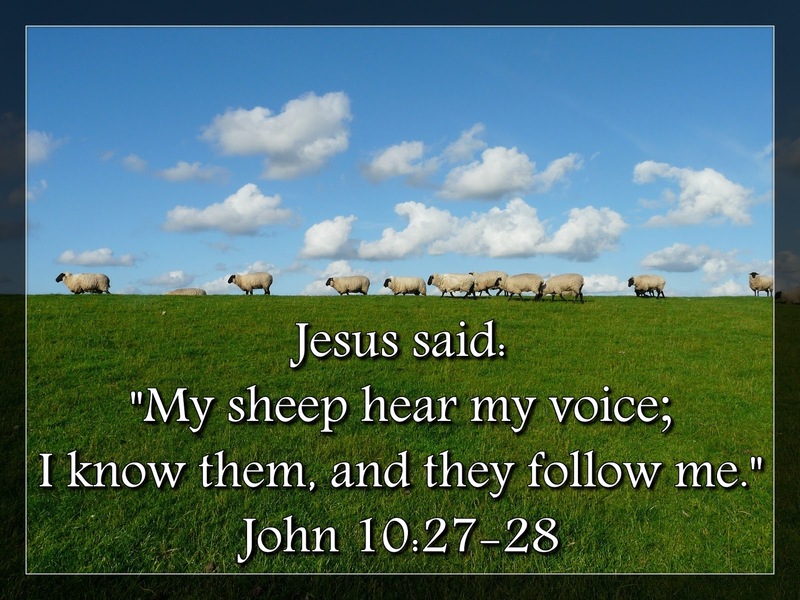 In our Gospel for today we are called to be like sheep, we are called to listen to the voice of the Lord and to follow him. We do this not to be ignorant, or complacent, but to see through the eyes of a child. We hear at other places in the Gospel that to enter into heaven we must be like little children. We question it's true, and natural, we all will grow in our faith, grow in our desire to understand. Nevertheless, in the end, we return time and time again to receive our Lord from this altar, to receive our Lord as often and as best as possible. See in this white garment the outward sign of your Christian dignity. With your family and friends to help you by word and example, bring that dignity unstained into the everlasting life of Heaven. We help one another to do that, we help one another to maintain the purity of Innocence that was there at the moment of our baptism when all of our sins, even original sin itself, is washed away. The priests, deacons, and servers all wear white garments to celebrate Mass. 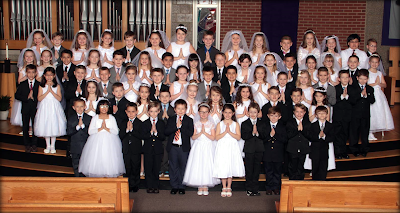 In fact all of us could come wearing white every time we celebrate the Eucharist together; but on the first occasion these children especially have the honor of dressing up in their suits and white dresses to receive that which sustains us through our entire lives and helps us bring our dignity unstained to heaven. I had the privilege and honor recently of assisting one of our elderly into the arms of God. When you're at that stage, when a person is almost ready to give up their hold on life, it can be difficult to receive the Eucharist. So there with that man in his final days I broke the Eucharistic host in half and showed the half to him and asked ‘would this be okay?’ He just kind of glared at me, so I broke it into quarter pieces. ‘Is this okay’ I asked again, but he maintained his look of uncertainty. Finally I broke a small bit off the corner and I placed it on the back of his lips so that it could simply dissolve. That little bit of Eucharist was exactly what he needed in those moments. That little bit contained the entirety of God’s love for him and us all. We call the rite of giving the Eucharist to the dying viaticum, which means food for the journey, it's not only the end of life journey but our journey through life that Christ sustains us for. We all, at our baptism receive our vocational calling from God. God may call us by name to the married life, to the priesthood, to the religious life, to the single life; all of us are called by God to follow him in our own way. This call is maintained through the Sacrament of Reconciliation, the Sacrament of Confirmation strengths our understanding of that call, but that calling is kept alive by the Sacrament of the Eucharist. We hear that call from God throughout our lives and we return to the Sacrament of the Eucharist time and time again; we can be more like these little children who will receive our Lord for the first time today. Children, if you are anything like me you'll go home and start taking a tally: I received the Eucharist twice, I received Eucharist three times... 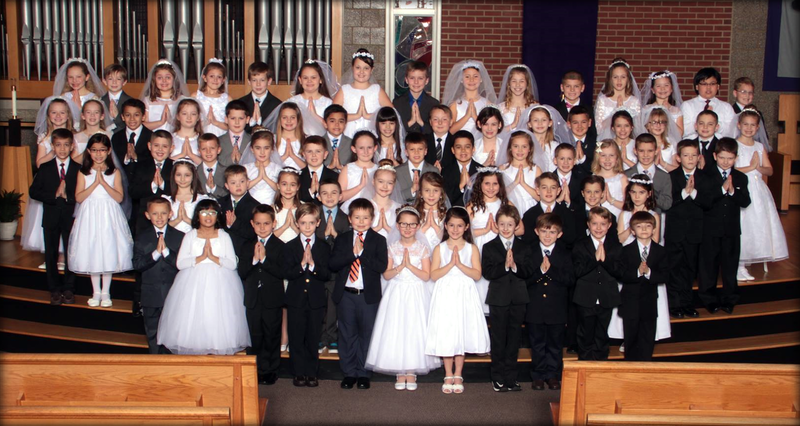 I've heard it often from people when they reflect on their First Communion and I did the same. I got a couple months in and then forgot where the paper was, but I came back to it later and put a bunch of marks on it figuring ‘that's about right.’ Christmas came and I realized that I had and would continue to receive the Eucharist countless times. The tally was important for a while but the living out the mystery of the Eucharist became more important the older I got. We receive our Lord over and over again, and each time we receive this tiny bit of the Body of Christ it has the ability, and the promise, to change our entire lives. 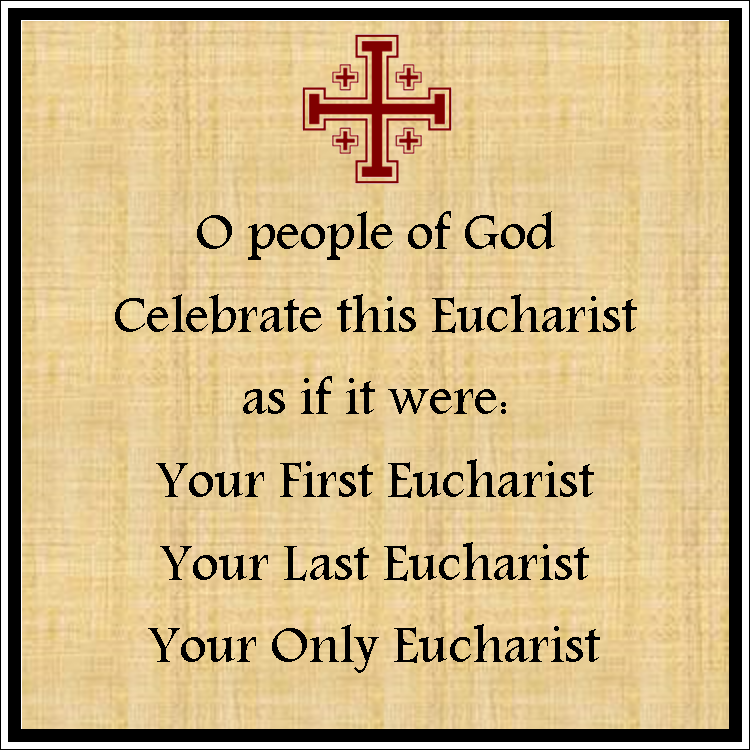 Celebrate this Eucharist like it is your first Eucharist, your last Eucharist, you're only Eucharist. Prayer brings you closer to God, or invites God closer to you; whichever way you want to look at it prayer is a good practice to grow in one's relationship with God. Is that, however, all prayer does? Is it all just me and Jesus with other people entering as occasional supportive actors? 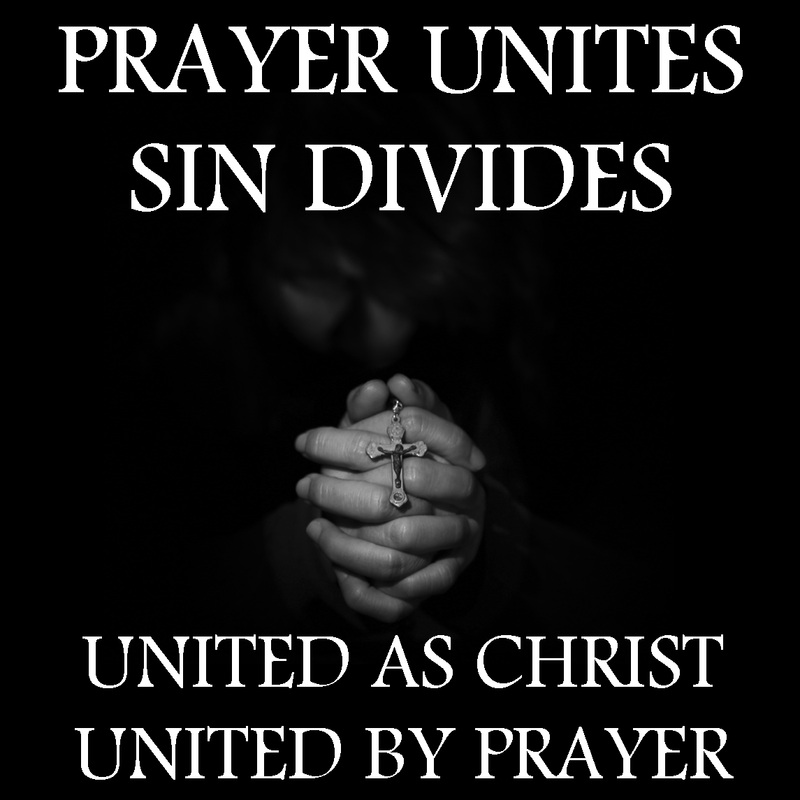 Or are we called to be united as the single body of Christ? As a happy Catholic, I certainly lean towards the latter and away from the former. 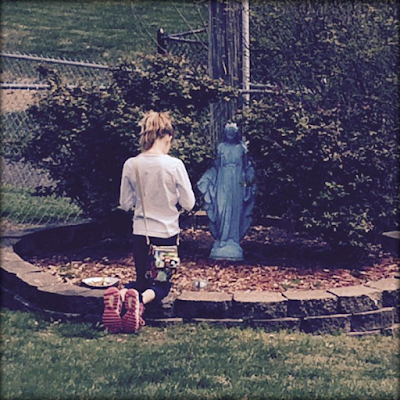 As a Catholic Christian, as a 'universal' Christian, I cannot settle for just me and Jesus. To do this would essentially be a sin, the sin of omitting one's obligations to other people in the least, and more likely the sin of pride through the desire to focus on one's self to the detriment of others. 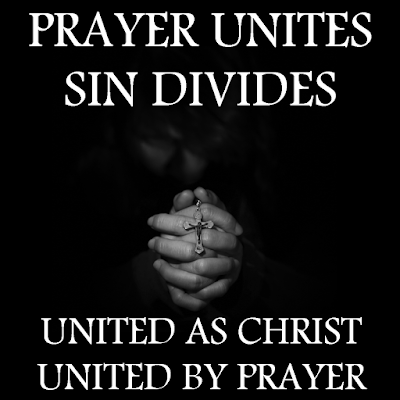 So prayer is meant to unite us to one another, as well as unite us with God. In fact, the closer we come to God the closer we should come to one another. Pride can convince us that we do not need to share our prayer needs with others. We can get stuck on feeling needy, or seeming weak. We can worry more over how we appear to the people close to us rather than reveal who we truly are. If you stop long enough to really think about it, all of us are a walking disaster in one form or another. We all need help, we all have a list of issues and needs that we can share with another, but it just seems so much easier to pretend that we have it all together. It's not easier, it's a lot hard to try and fool each other, ourselves, or God that we're in control - because we're not. In this season of Lent, you can let go a bit more of that failed attempt to appear self-sufficient and do what Christians do, which is to ask for prayers from another living human being. I've even made it a bit easier for those still getting used to the idea: go here! I cannot count the number of people who have talked about their uneasiness with asking another person to pray for them. Start here, start now. 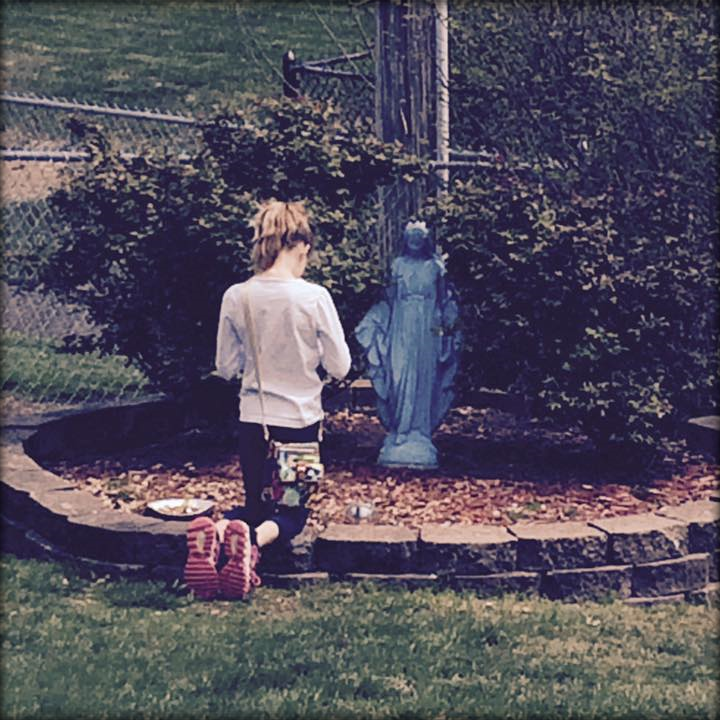 There is no better reminder that we are not alone in the world than the act of praying for one another. A link to this confidential prayer form is available on the right sidebar at the top of the page. You may bookmark it, share it, whatever you feel called to do to answer the invitation to share prayers and to invite others to do the same.